To some it is the Millennium's mega gathering. To others a spiritual extravaganza. But to most devotees Kumbha is the doorway to heaven and Moksha. There is not a single poster. No ad campaign. Not even a cursory invitation. Yet the city of Allahabad is where all roads lead to for the next six weeks. It is the Kumbh---the biggest congregation of people at a place for a common cause. A visit to the holy city at this time showcases what spiritual life means to the teeming masses of one-fifth of the world population. In the Varaha Purana, Prayaga (modern-day Allahabad) is glorified thus: "In Prayaga, there is the Triveni (the confluence of three rivers: the Ganges, Yamuna and Saraswati), where Lord Shiva resides and is known by the names Sulatanka and Somesvara. Lord Vishnu is known there as Venu-Madhava. By bathing there one goes to heaven, and by dying there one gets liberation." The Kumbh comes in cycles of six and twelve years, termed as Ardh Kumbh and Purna Kumbh respectively. Both are spectacles of piety and faith that have held the Vedic stream of belief over the centuries. Without a codified system that lays rigorous demands on the individual, the Vedic system has amalgamated the consciousness of man and the finer aspects of nature into what the celebrated historian Arnold Toynbee calls " The wonder of India'. Says Bhaktiyoga Swami, head of a religious ashram in Rishikesh, " Kumbh is auspicious for all, irrespective of their spiritual faiths. It promotes the development of the human spirit." During Harshwardhan's rule the Chinese traveller Huien Tsang also visited the city and from his descriptions it is amply clear that not much has changed - neither in spirit nor devotion. The mela goes on as it has for thousands of years. But a lot has changed as well. When the last Purna Kumbh was held in 1989 there were no satellites in the sky, no mobile phones, no Internet and hardly any television channel---foreign or Indian - covered it live. In 1989 over 15 million people took a dip in the holy waters and the feat was registered in The Guinness Book of World Records as " the largest gathering of human beings for a single purpose." This time around 70 million people from around the globe are expected to attend the 6-week mela. Technology has made the world a global village. Allahabad itself has undergone change for this mega festival. A huge tented city has sprung up housing sadhus, ashrams, tourists and pilgrims. The logistics are confounding. To manage a crowd of not a few lakhs but crores is an indomitable task. The Mela officer, who is the one man responsible for this world's largest religious occasion, in sheer numbers of people at least, is not perturbed. Over 10,000 security personnel oversee a humanity of millions who throng here. There is an air of relaxation on the faces of devotees. As the massive yatra of sadhus marches towards the ghats, the milling crowds strain to catch a glimpse. They come on horseback, elephants, hand drawn carts, motorised chariots and barefoot. The religious heads of various ashrams of all denominations file past in a glorious frenzy of song, dance and prayer. Down the ages, the all-male bastion of Sadhu has seen a transformation with women Sadhavis actively participating with their all-women followings. A few lady spiritual leaders share the limelight with their followers. Sarla Mataji, from Ranchi, follows the Juna Akhara with the all male procession. The Naga Sadhus, who walk with nothing but their spirit, are the most revered for their total renunciation. At night the whole tented city is an awe-inspiring sight with twinkling lights and strains of religious music filtering through the fog. There is a steady stream of devotees moving towards the river to bathe in the icy cold of the January night. Yet the diminutive man with his child and sack of belongings has no trepidations. For him and his family, it's the doorway to moksha. The MNCs may peddle their wares, the tea stalls, soft drink giants, Ayurvedic companies and jadi-booti wallahs - all may be here to market, entice and sell. Yet the multitudes thronging the quietly flowing river have a song in their hearts that only the devout can hear. And maybe the Gods too. Indian tour operators, who are selling Kumbh to international travellers as the exotic spiritual commodity from the east. According to a Times of India report "The tour operators have also arranged special discourses by spiritual leaders for their premium clients. Consultations with astrologers have been included as a special service. " French mineral water Danone International, which bottles the Evian brand of water, is making arrangements with Cox & Kings to bring water from the Alps for premium guests. ``It's a great opportunity to push our products and increase their visibility in this spiritual Olympics,'' Amit Mathur, northern regional head of Evian, said. All rooms in hotels of all categories are booked. And with demand peaking, prices have also peaked. ``A room that used to cost Rs 200 in normal times now fetches Rs 1200,'' said a tour operator. The sheer logistics of the month long bathing festival is the stuff of modern myths. 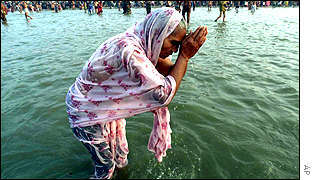 On January 14, the day of the first shahi snan, 8 million are expected to take the holy dip. On January 24, the mauni amavasya, 30 million are expected to take the dip. Over 145 km of pipelines for water supply have been laid only for the mela site. This does not include the 120-km-long connecting pipes. 26 tube-wells have been specially bored at the ghats to service the water pipelines. 450 km of overhead power linkage, to be serviced by 35 dedicated sub-stations, has been set up to light up 15,000 streetlights. 5,000 ashrams have been organised, including 1,000 for pilgrims from abroad. About 10,000 security personnel have been deployed.